Order of Battle of 62nd Army. Lieutenant General Vasili Ivanovich Chuikov. 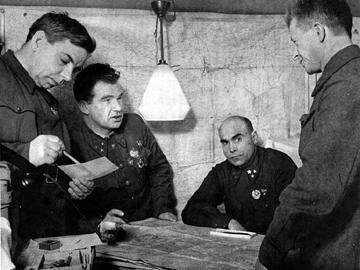 13th Guards : General Aleksander Ilyich Rodimtsev. 37th Guards : General Viktor Grigorivich Zholudev. 39th Guards : General Major Stepan Savelivich Guriev. 95th : Vasili Akimovich Gorishny. 138th : Ivan Ivanovich Gorishny Lyudnikov. 193th : General Fedor Nikandrovich Smekhotvorov. during heavy fighting in Stalingrad.